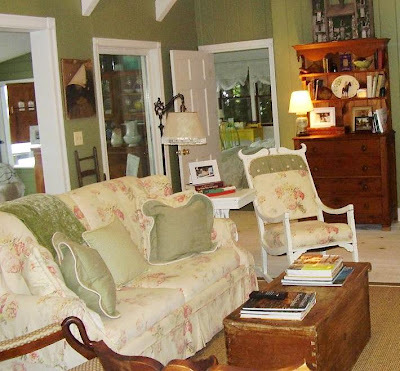 Visualize the perfect spot to spend time relaxing, reading and sipping coffee in a comfortable cottage setting. Now transform this visualization into a style that says relax. The effect is comfortable and inviting, it is Cottage Style. We know it when we see it, wood and painted furnishings mixed with muted tones of color, mis-matched chairs around a dining table, formal and casual accents blended together, floral fabrics with ruffle details, vintage lighting and architectural remnants. But how do you begin to create your own cottage style? The starting point to redecorate your home to suit your taste and lifestyle is a floor plan. This will define what will fit into the space. Don’t rely on keeping every detail in your head; write your ideas and intentions on the floor plan. Once your plan is done, focus on things you love and use that as the inspiration for the color palette and decorating details. A great way to establish a color scheme is to find a fabric that wows you and use that as a guide. Once the floor plan and color scheme is established, go shopping. You will know exactly what you are looking for and can easily make decisions. You will avoid buying furnishings that don’t fit into your space. 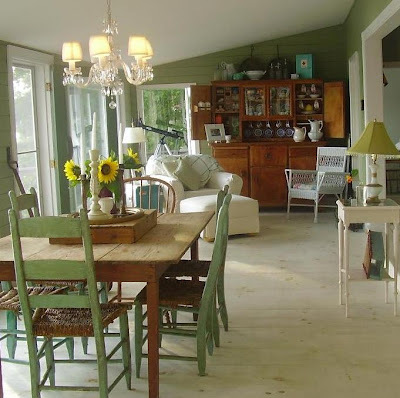 The photos highlight a real-life example of cottage style. It is relaxed, not perfect and a place where everyone can be comfortable. Soothing shades of blue make a bedroom peaceful. A headboard is made from window shutters with a cute cut-out that are painted and distressed. Vintage chenille bedspreads were made into pillows. Hang a formal crystal chandelier over a well-worn farm wood table and you have instant cottage appeal. For a casual seating area, bring the furniture close together, have a place to put your feet up, place lamps for reading and add tables for beverages. Have fun while creating your cottage décor and remember to design your home to accommodate your everyday lifestyle.